Pope Benedict XVI has made a historic visit to the former Nazi death camps of Auschwitz and Birkenau at the end of his four-day tour of Poland. The German-born Pope had personally insisted on visiting the camps where more than a million people, mostly Jews, were killed in World War II. 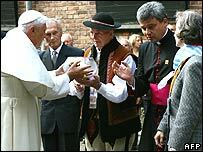 He prayed for peace in his native tongue at a ceremony at Birkenau. It was particularly difficult as a Christian and a German pope to speak from such a place of horror, he said. "In a place like this, words fail. In the end, there can only be a dread silence - a silence which is itself a heartfelt cry to God: Why, Lord, did you remain silent? How could you tolerate all this?" he said in a speech in Italian. "Our silence becomes in turn a plea for forgiveness and reconciliation, a plea to the living God never to let this happen again." The pope's prayer was the first time he had publicly spoken German during his visit to Poland, and there had been some uncertainty - and controversy - over whether he would use the language at the camps. 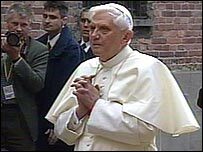 Pope Benedict's visit to the camps began when he walked alone under the infamous "Arbeit Macht Frei" gate at the entrance to Auschwitz, where he met survivors and said prayers. He was to have been driven everywhere during his visit, but the BBC's David Willey at Auschwitz said he wanted to walk around the camp and meditate alone. After entering the camp, he said a prayer in front of a reconstruction of the execution wall where Nazis lined up and shot thousands of prisoners. He lit a candle in memory of the victims of Auschwitz, before meeting 32 survivors who had returned to the camp to greet him. Pope Benedict, a former involuntary member of the Hitler Youth, then visited the cell where Catholic priest Maximilian Kolbe died in 1941, after offering to take the place of a prisoner whom the Nazis had sentenced to death by starvation. He then left the camp to visit the nearby Centre of Dialogue and Prayer, where he was greeted by nuns from a nearby convent. The Pope blessed the centre before moving on to the site of the gas chambers of Birkenau, where he stood in reflection at the monument to victims of the camp. He slowly walked past 22 tablets commemorating the 22 languages spoken by those killed there by the Nazis. Some 500 people, including former Auschwitz inmates and representatives of Jewish communities around the world, attended the Birkenau ceremony. The BBC's Adam Easton, who was also at the ceremonies, says the Pope made no apology on behalf of his countrymen, nor did he make a direct reference to anti-Semitism. Before Pope Benedict's visit, some Jewish groups had said a German Pope speaking the language of the Nazis would insult the memory of the million or more Jews murdered there. The Pope's spokesman, Joaquin Navarro-Valls, said the pontiff was making his visit to Auschwitz Birkenau as a "son of the German people". He revealed that the trip was not originally in Benedict's schedule, but that the 79-year-old pontiff had personally insisted on it. Thousands of guests welcome Pope Benedict XVI to the White House for his meeting with President Bush.